A "yellow vest" demonstrator lost his hand during clashes with police outside the main parliament building in Paris on Saturday, during a 13th weekend of anti-government protests across France. 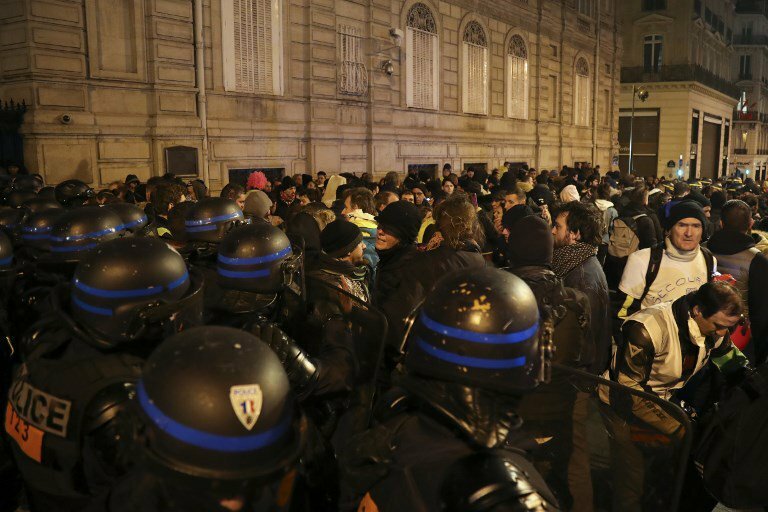 Photo: AFP Protesters face police officers during a demonstration in Paris on February 9, 2019 as the "Yellow Vests" protesters take to the streets for the 13th consecutive Saturday. As the march continued, vandals burned rubbish bins as well as cars - mainly luxury models - vandalising bus shelters, cash machines and shop windows along the route. One witness said the victim was a yellow jacket photographer taking pictures of people trying to break down the barriers protecting the entrance to the National Assembly. "He wanted to bat it away so it didn't explode by his leg - and it went off when he touched it," he added.